Keep answers at your fingertips! Eliminate knowledge gaps with expert insights and support only found in the new 2018 NFPA 99, Health Care Facilities Code Handbook. If you are responsible for safety and compliance in the health care setting, NFPA®'s Health Care Facilities Code Handbook is indispensable. 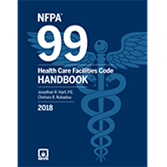 Based on the updated 2018 edition of NFPA 99, Health Care Facilities Code, the Handbook helps you avoid confusion or mistakes that may jeopardize the safety of patients or staff in both new and existing health care facilities. Specifically designed for today's challenges, it's a unique source of Code text plus expert commentary, 2012 CMS K-tags to assist with CMS compliance, and much more. New indicators showing the CMS K-tags from the 2012 edition of the Code that CMS surveys to, allowing for easy comparison of 2018 edition requirements with those enforced. Special icons, preparedness boxes, and checklists help ensure you're prepared for surveys. Special design elements highlighting requirements for existing facilities. Facility managers can see what specifically applies to their existing systems and buildings and plan for compliance. Apply the 2015 NFPA 99 correctly and confidently with expert insights in the new Health Care Facilities Code Handbook. Based on the 2015 NFPA 99: Health Care Facilities Code, NFPA®'s Health Care Facilities Code Handbook helps eliminate confusion or mistakes that may jeopardize the safety of patients or staff in both new and existing health care facilities. Redesigned and updated for the many challenges faced in today's field, the Handbook features a wealth of expert commentary addressing the full range of concerns. Special design elements highlighting requirements for existing facilities. Now, facility managers can see what specifically applies to their existing systems and buildings and plan for compliance. Interested in other editions of the NFPA 99 Handbook? Use the drop down menu above to select the edition year you need. Interested in other editions of NFPA 99 Handbook? Use the drop down menu above to select the edition year you need.